Yes, yes, Mr Stower - I get how you feel the AEs simply musta wrote the number 10 ('n') sideways onto these roofblocks. The did it for dates so, according to you, they musta also did it for the 'n' sign in any other number. Except nowhere outside the Vyse Chambers do we see it. The FACT of the matter is this, Mr Stower, no matter how many hieratic texts you care to look at, whether very early old hieratic (which look very close to their hieroglyphic root sign), or even later hieratic, the sign for 10 is ALWAYS 'n' and is NEVER rotated. 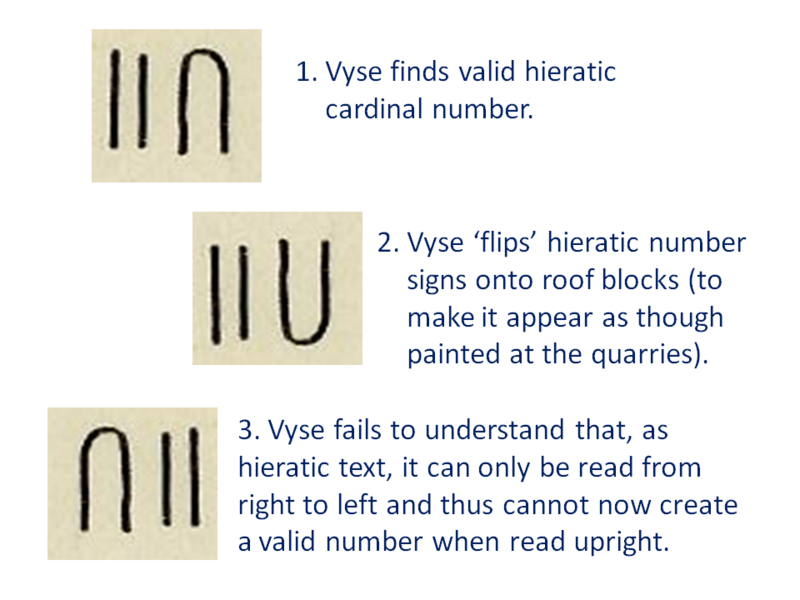 For you to continue to insist the 'n' signs in the Vyse Chambers are rotated requires much, much better evidence than you have yet presented because the simple truth of the matter is this: the evidence, such as it is, strongly suggests the 'n' signs in those chambers could only have been placed there upright (and flipped) - there is just no evidence from anywhere else that such a sign (unless it's a date) would have been painted sideways. None. Nadda. Zilch. Everywhere we care to look, we ALWAYS see the 'n' sign UPRIGHT. That's the FACTS. Even Samuel Birch recognised that much as he totally re-arranged the 'n' to be upright in his consideration of these markings and read from right-to-left. IMO, what we are actually witnessing here is the mistake of someone who believed these markings could be read from either direction and who simply flipped each of the signs to create an illusion of authenticity; by making them appear upside-down it suggests they were not painted in-situ and, as such, musta been done at the quarry, ergo they must be genuine. All very clever, all very Toryboy sneaky. But too clever for his own boots. Size 'n' I suspect. Now I know you don't and never will accept ANY of this. That's your inalienable right. Good luck convincing others that you're opinion is the right one. I think you'll need it. Edited 5 time(s). Last edit at 15-Feb-18 16:50 by Scott Creighton.